Summer nights, pizza, and a song... ready for some inspirational dinner music? Well, really anytime of the day is good for some back up, some faith, some hope. A time to be thankful, brave, and hopeful. What does a pizza shop have to do with music? Sharing, caring, and growing in God's world by offering great food, great experiences at the restaurant, and now a CD that is pretty awesome for car rides, backyard barbecues, youth groups, picnics, gifts, and sharing. Pizza Ranch was created by Adrie Groeneweg in Hull, Iowa in 1981. He was 19 at the time and thought why do people have to drive out of town to get a pizza in his area? With that idea six specialty pizzas were created by his mother , Lorraine and Pizza Ranch began selling pizza with a vision and mission to glorify God by positively impacting their guests. 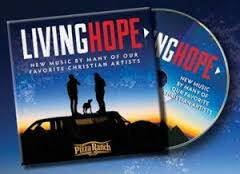 Pizza Ranch recently released a CD titled LIVING HOPE. There are 12 songs from many of their favorite Christian artists. The CD contains new songs written for the CD around the theme HOPE. Listen: tap YouTube to hear more of the CD. Savior's Arms is my favorite song. Good back up for a thankful day or I need some help kinda day. Good customer service is notable and memorable and has led to over 190 locations of Pizza Ranch in 13 states and a bigger menu! $120,000 has been donated from Pizza Ranch to Porter's Call for recording artists in conjunction with this CD. Enter the rafflecopter widget for your chance to win a copy of Living Hope CD. Open to residents of USA and Canada. No PO Boxes. "Disclosure (in accordance with the FTC’s 16 CFR, Part 255: “Guides Concerning the Use of Endorsements and Testimonials in Advertising".